Once upon a time there was a precious little 4-year-old named Lindsey. She was quiet and reserved and detested the wearing of all pants and shorts. Skirts and dresses were more her style. On one ordinary preschool day, this sensitive child decided to wear a denim skirt. It was a true moral dilemma because, though it was a skirt, it also was constructed of a rough denim fabric, which she'd sworn off in all less frilly forms. Lindsey paired the fashion-forward '80's mini skirt with her white Keds and set off for a grand day at school. All was going well until her class of preschoolers took a visit to the school library. She quickly selected a Serendipity book and made her way to the checkout line. As she waited her turn, a stream began to trickle down her legs, down her shoes, and onto the floor to make a small puddle. She'd wet herself! It wasn't but a quick second until her teacher ran over to address the situation. Lindsey was mortified and began crying as the other students snickered and pointed at the mess. The teacher sweetly took the shamed little girl to the restroom and gave her dry clothes to replace the wet ones. Once Lindsey rejoined her class, it was as if the accident had never happened. The kids had already forgotten the puddle. Looking back on that incident, I can't help but wish that grown women would function in the same way as kids. Aren't we the worst about pointing out the mistakes and faults of other women, even our dear friends and family? And boy, once somebody messes up, her name goes down in infamy! Ladies, I'm putting out a challenge for myself and for you -- SHUT YOUR TRAP! Let's stop heralding other's faults and failures and start stepping in with kindness and comfort. Let's stop hiding our struggles and accidents in fear that others might find out about them. Instead, let's be the first among our circles of influence to cut through our facades of perfection and just be real. Let's look at each other's hearts. Let's be godly. 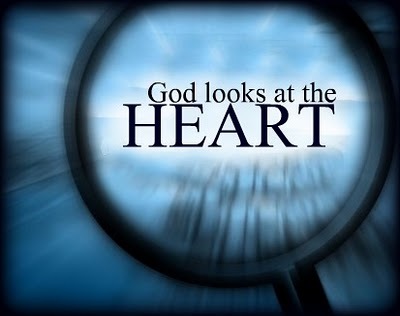 For the Lord looks at the heart.